I love smoked fish and also the combinations of proteins. 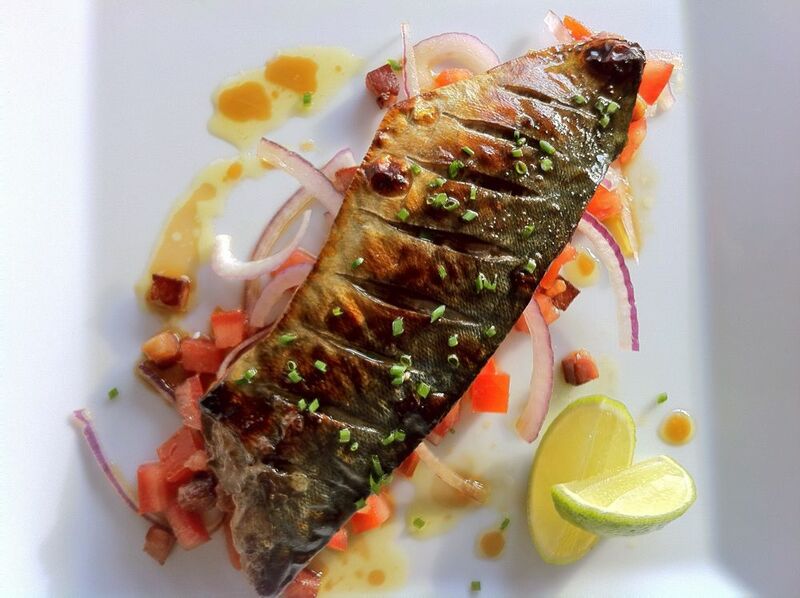 Here comes the idea of combining a fish such as mackerel with smoked bacon. If you like the smoked fish flavor, apart from salmon there is more!. I am just tired of seeing smoked salmon. With all due respect .... if have seen too much!. I think it's the most common canapes in the world. Instead, try smoked sardines, cod and herring. And if you want to explore more this concept, try this recipe. 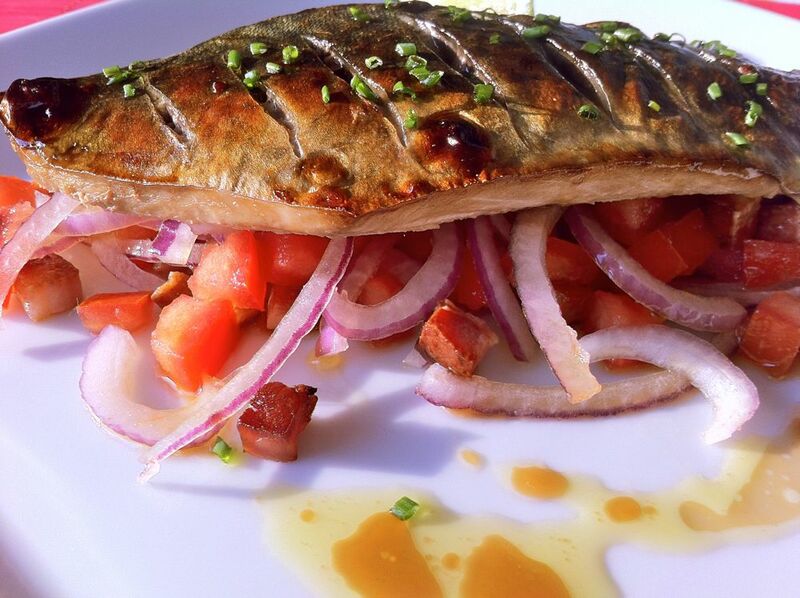 The mackerel (fresh) cooked on the grill, the smoked bacon sautè and then mixed with a tomato and red onion salad. The sauce made of lime and soy. Cut the onion thin and keep them in ice water to remove that strong and spicy flavor. Sautè the bacon, cut into cubes in a pan until golden color with a drizzle of extra virgin olive oil. 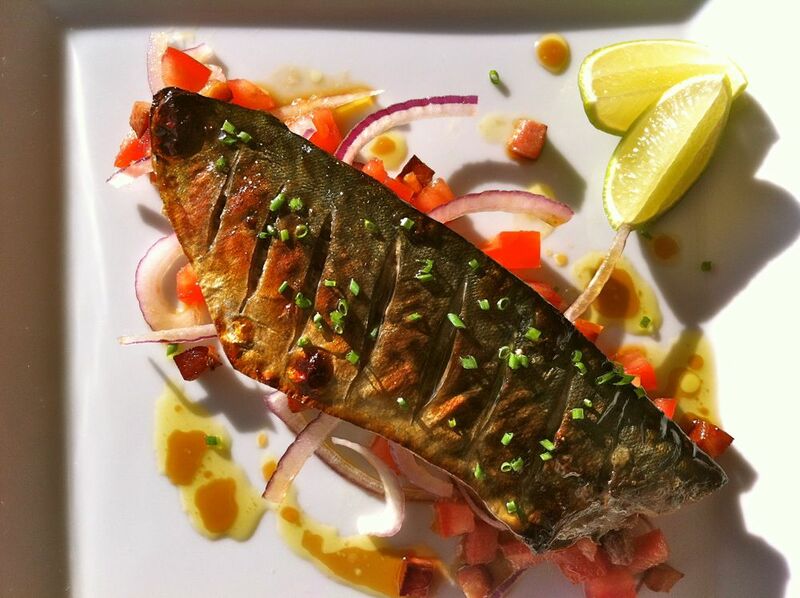 Season the mackerel fillets with little salt and the oil/fat remaining in the pan of the bacon. Bake mackerel skin up for about 10 minutes (depending on size) or until cooked, without turning them. For the sauce, melt the sugar with the lime juice and then add the soya sauce and 2 Tbsp of water. Season the diced tomatoes with onion, bacon, two tablespoons of extra virgin olive oil and a bit of the sauce. Serve with the fish and the rest of the sauce on the side for dipping the mackerel.